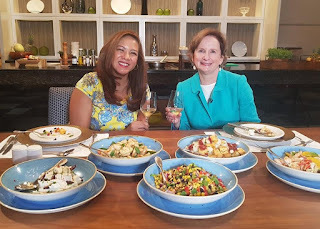 The segment, which airs every Friday during “Early Edition” on ANC, the ABS-CBN News Channel, gives viewers a chance to learn about other food cultures and understand historical ties with other countries, as Annalisa converses with foreign dignitaries from countries such as United Kingdom, United States of America, France, and the United Arab Emirates in an informal setting away from the newsroom. Annalisa, who used to host an international food travel series, said she hopes to engage people by featuring food in her segment and make them aware of global issues in the process. “Filipinos tend to focus on domestic issues. In this era of globalization, our citizens, especially the youth, should have a regional and global perspective. By incorporating food in my series, I hope to appeal to younger viewers who aspire to travel to or work in other countries,” she said. On the next episodes, viewers can also look forward to joining Annalisa for a cooking lesson with the Thai Charge d’affaires and interviews with the ambassadors of Colombia and Morocco. Previous episodes of “Food Diplomacy” are also available online on the Facebook page of “Early Edition” (facebook.com/ANCearlyedition). Catch a new episode of “Food Diplomacy” with Annalisa every Friday at 6:45 am during “Early Edition,” with replays on Saturdays at 4:30 am and 8:30 pm, and Sundays at 9:30 am, on ANC and ANC HD or online via www.iwantv.com.ph or www.skyondemand.com.ph. For news, follow @ANCalerts on Twitter, Facebook, and Instagram or visit news.abs-cbn.com/anc.